Like most animated films, this one should be just as enjoyable on the small screen. Terrific, very detailed commentary track in which the directors and one producer get quite excited about telling stories of the film's creation, and how much it evolved in the process (almost all the changes clearly for the better). Tons! But they're kind of hit and miss. The behind-the-scenes featurette on Disc 1 includes everything from "The Tech of Shrek" and the technical goofs on Disc 2. There's video of storyboard pitches for scenes that were deleted (what's the fun in that?). "Interviews" with the characters are a little slapped together and not that entertaining. Huge DVD-ROM games & goodies for kids -- if you have a Windows PC. Plus, the commentary comes with or without subtitles. Transfered straight from digital source, so it's gorgeous. 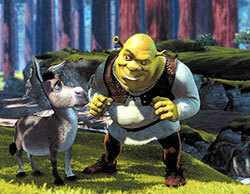 Once upon a time there was a mean ogre who lived in an enchanted forest full of suspiciously familiar characters. There was a trio of little pigs forever on the run from some wolf. There was that little wooden boy who was a pathological liar. There was another wolf dressed up like some little blonde girl's grandmother and there were those seven midgets forever fretting about that beautiful girl in the glass coffin. One day Lord Farquaad, the despotic pygmy-sized prince of this faraway land, decided he wanted the forest cleared of its chimerical critters, pixies and narcoleptic princesses. They were all forcibly "resettled" in the swamp of the ogre. And boy, was he peeved about it. Shrek, for that was the ogre's name, marched right into Farquaad's Disneyland-caricature of a castle and demanded, with all his ogrely gruffness, that his overrun swamp be cleared of unwelcome creatures, and the weasely prince made him a deal: Farquaad would restore the solitude of the ogre's swamp if the ogre would go on a quest to rescue a beautiful princess -- from the highest tower of the grandiose ruins of a castle, located in the mouth of a volcano and guarded by a fire-breathing dragon. You see, Lord Farquaad wants to marry this princess, but he's too much of a coward to rescue her himself. Such is the fractured fairytale setup for "Shrek," a drolly satirical but genuinely enchanting animated adventure brought vividly to life by the DreamWorks computer cartoon crew that so brilliantly blended the magic of CGI and the kvetching of Woody Allen in 1998's "Antz." "Shrek" is similarly and even more deliberately off the beaten path that Disney cartoons have trod through just such forests for eons now. Each of these stock characters is moderately aware of the cliché of their existence, and as such, the beautiful princess has long been sitting around her tower, over-romanticizing her inevitable rescue (like a teenage girl plans her wedding) by what she's sure will be a handsome knight. Shrek isn't what she had in mind. Mike Myers slips into a fake Scottish brogue to provide the gentle voice of this grumpy, lumpy green giant with fluted ears, who sets off to the castle grumbling about his lot in life to his unwelcome sidekick, an obnoxious donkey (with Eddie Murphy's scene-stealing voice) who just won't leave Shrek alone no matter how mean the big guy is to him. At the castle the rescue goes off only after the fanatically rendered dragon falls head over heels in love with the donkey, a development that allows Murphy no end of ad-libbing fun as he plays up his exasperation. As Shrek leads the princess (Cameron Diaz) back toward Farquaad's castle, adventure ensues (of course), wisecracks abound, love blossoms, etc. But "Shrek" goes out of its way to turn these clichés on their ears with a self-mocking sense of humor that fairy tale features have been in dire need of for a long time now. Example: After spending a night on the road, the princess wakes one morning and wanders into the forest to sing with a beautiful birdie -- which then explodes at the sound of her glass-shattering voice. Next shot: The princess serving Shrek eggs for breakfast. "Shrek" is jam-packed with this kind of startlingly off-kilter and sometimes off-color humor, making fun of dozens of fairy tales and taking devilish jabs at Disney. But in the long run the story, disappointingly, falls back on the exactly kind of trite plot devices the movie should be making fun of. Shrek and the princess have a silly sitcom misunderstanding -- based on a partially overheard conversation -- that drives them apart despite their obvious romantic attraction. Plus, she has a "horrible" secret that would, in fact, bring them closer together, but she's too stupid to realize that. Other nagging problems keep this ingeniously campy caper from really soaring the way it could have. The animation, which is nearly photorealistic for the four main characters, is only video game-quality on many of the background players. They have wobbly walks and faces that look like photographs melted onto vaguely human frames. Although it's the inconsistency that makes it annoying, the animation issues could be written off to a style decision. The use of aging pop songs on the soundtrack, however, is just a flat-out mistake. "All Star" by Smash Mouth not only doesn't fit the fairy tale atmosphere at all (even in this irreverent fairy tale), but it's two years old, already strongly associated with another movie ("Mystery Men") and will only serve to severely date "Shrek" in years to come. But while I could nit-pick dozens of easily resolved problems with this movie, luckily directors Andrew Adamson and Vicky Jenson throw so many inventive, subversive comedic curveballs that "Shrek" easily makes up for most of its mistakes. My personal favorite: The deck-of-cards-looking Farquaad (with the perfectly menacing-sissy voice of John Lithgow) is torturing the Gingerbread Man in an early scene -- biting off a leg, dipping him in milk -- to which the Gingerbread Man defiantly scowls, "Eat me!"